Since my marathons in May I have got myself in quite the running funk. To get out of this funk I have decided to get a PR in the Harvest Half Marathon or Okanagan Half Marathon in October. I am pretty excited because one of my best friends is going to do one of these with me! She didn’t know this until a couple days ago but luckily she is really excited too! Heck maybe I can get my dad in it too. I don’t want to push my luck though! 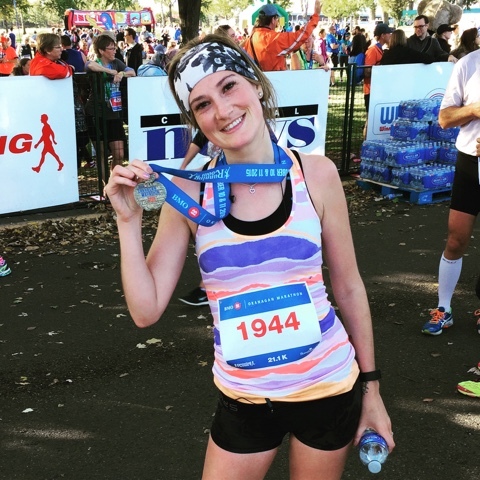 What I learned from my last endurance run was that consistency and cross training are key. My friend at the running room commented on how amazing Hal Higdon’s training program is so I am going to give his Advanced Half Marathon Plan a try! I usually make my own plan but I feel like I should trust those who know best so here is the plan! The only changes I made was incorporating cross training into the plan. I will be starting on week two since I essentially have done the first two weeks of training already however my pace will be a work in progress for the next couple weeks. Cross training activities include yoga, barre, kick boxing, zumba, paddle boarding and swimming. A very knowledgeable man/runner (John Stanton) told me to picture my goal and it will be possible. I can see it and I know I can do it. Monday I started with 3 km’s. Today I will do 7 hills, 3 miles Wednesday, 30 minutes tempo run on Thursday, Paddle boarding and yoga Friday and a 10k Race Saturday! I am really hoping to get adjusted to these pace guidelines by mid August. I haven’t exactly disclosed how much training or the paces we are going to be doing to my friend yet but will definitely note her response when I send her the workouts. So here we go! This is going to be an amazing journey and I will share it with you all as I go. As always tips and comments are appreciated. Loving the goals and structure behind it; planning will make sucsess even more likely! I’ve just come across this via twitter (a hashtag, of course) and thoroughly enjoyed the read – I wish you nothing but luck with it! If you decide to relook at that cross training however, I am a strength and conditioning coach here in Calgary and have no doubt that we could do something a little more structured for you and your needs. I’ll not push it anymore but if you’d like to come into our facility I’d love to give you a tour and explain how we can help you make that goal a reality! Hi Shane, Thank you for your comments! I am always open to new options in training and love guidance. Where is your facility? What is your specialty?